I have long been fans of Michael Migliroe and wife Yancey Stanforth-Migliore. They have built their winery up over the last 15 years like few people in New York state. They are one of the best promoters and producers in the Hudson Valley. However, in the last few years, with winemaker Brad Martz, the wines have been incredible. Last week I stopped by and tried two wines quickly before the shop closed! Always oustanding is their Gamay. The Whitecliff Reserve Gamay Noir 2016 was another exceptional wine. Light strawberry and bright cherry pop out of the glass, and the nose is only a tease. Cherry, strawberry, and light raspberry, swirl with a hint of earthiness, and a dollop of vanilla that turns this red wine into something other worldly. This is easily one of the best Gamay's on the east coast. Phenomenal. The Whitecliff Vineyards Two Cabs 2014 is made from almost equal parts from Hudson Valley grown Cabernet Franc and Cabernet Sauvignon. The fruit was harvested at 21 brix, went through malolactic fermentation, and was aged 14 months in American and Hungarian oak. 20% of that was new oak. This dry medium-bodied to dark red, had a lovely color, and oozes charm right from the get-go. It features bright and dark cherry, and red raspberry. All those come across on the palate as well as cassis, blackberry, minerality, and a healthy doe of tannins and a touch of black pepper. This is a wonderful wine, perfect for roast chicken, pork, or a lovely roasted veal. Another lovely step forward for red wine in the Hudson Valley. Great job Mike and Brad. Great work! Outstanding! So, in July of 2018 I finally made it down (with my friend Rich Srsich) to Nostrano Vineyards in Milton, New York. I hadn't told Nic Bozzo and Kayleigh Marquis Bozzo I was coming. 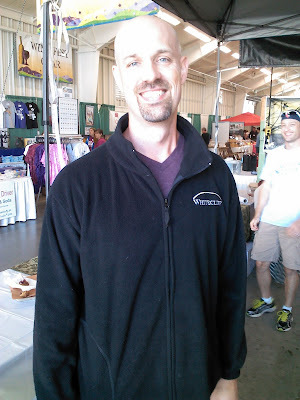 I had first tasted Nostrano at the Hudson Valley Wine Festival held in September at the Dutchess County Fairgrounds. And in a limited tasting, I fell in love instantly. I had felt badly that it had taken me so long to get there. I felt a little sheepish going in. But when I got there, both Nic and Kayleigh were there, and made me and my companion feel like we were family. And it was wonderful, because these are good people. Nostrano is a family run 75-acre farm, vineyard and winery in the Hudson Valley. They grow 10-acres of wine grapes (they also grow some table grapes, and also have 15 acres of apples. This is a fourth generation farm, and yet is one of the newest wineries in the Hudson Valley. The Trapani family has been farming this land for fruit since 1943. Joseph Trapani Sr.’s grandson, Nicolas Bozzo, planted the Nostrano vineyards in 2010. Nic is a passionate grower. He wants to make the best artisanal quality wine in the valley. And that's why it's easy to like him. He unpretentious. He's a farmer first. And that's why it's easy to respect what he and Kayleigh are accomplishing. Nic was born and raised on his family’s farm in Milton, NY; attended SUNY ESF at Syracuse University acquiring his Bachelors degree in Landscape Architecture. During his Senior year of college he traveled to New Zealand to further his knowledge in Eco-Agricultural Tourism and Winery Design. Interested in Sustainability, Land Management and the shear beauty of a working landscape such as a vineyard, Nic saw potential back in the Hudson Valley at his family's farm. Kayleigh, who manages the tasting room and event director, is equally inspiring. She's friendly, very smart, out going, and very well liked. Kayleigh was born and raised in the Hudson Valley and graduated from The College of Saint Rose with a B.S in Business Administration. Having worked for several large Corporations in Human Resource Management, Finance & Supply Chain, Kayleigh works on the Operating end as well as our Event Director coordinating Annual Events, Weddings & Special Events in the Vineyards Barn & Tasting Room. The Nostrano Estate Riesling 2015 opens with a big aromatic bouquet of succulent fresh peaches and apricots. The wine was made in stainless steel, and while it starts of with green apple and other tropical fruits, it ends semi-sweet, or off-dry. A light, delicate, gorgeous Riesling. Very, very good! The Nostrano Estate Riesling 2016 is a completely different wine. Much more akin to their sold out 2014 vintage, this wine opens with a big nose of Granny Smith apple and ripe Bosc pear, and some other tropical notes. Where the 2015 had softened with the sweetness, this 2016 was huge with minerality and great acidity, finishing with a zesty, citrus-y pop! This was an exquisite off-dry Riesling. As good as anything from the Finger Lakes. Perhaps this 2016 may have been the best wine of the tasting (though I liked the reds) I thought this was the wine ready to stand on its own. A great accomplishment for a winery so young. Impressive. The Nostrano Ava Rosé 2017 was an accomplishment. The ose gushed with fresh bright raspberry and juicy watermelon as promised. Yet the end was all lemon and lime zest, with a lovely finish. This was an impressive wine as well, and would easily compete with any of the many wines from Long Island or the Finger Lakes. A very eye catching entry into the market.A wonderful wine!!!! I first tasted the Nostrano Estate Pinot Noir 2014 at the Hudson Valley Wine Festival, alonmg with their chardonnay. The 2014 Estate Pinot was as good as any Pinot Noir made in the Hudson Valley. Especially impressive, considering it was amongst their first offerings. The wine had been aged in American oak for 16 months. Lovely balance and holding layers of complexity, it showed the true promise of what the winery could produce. Easily my favorite wine that they have produced. The Nostrano Estate Pinot Noir 2015 was considerably lighter in color, more like a dark rose. But I embrace the notion that sometimes Pinot Noirs don;t have to be dark. Indeed, some of my favorites, from Santa Barbara, Oregon, and New York states all produce lightly colored but incredibly tasty wines. The 2015 Estate Pinot Noir was released in August 2017. The wine displays lovely aromatics of bright cherry and bright plum, layered with light cranberries, raspberries, and cherries. The flavors are very pretty and delicate but nonetheless, delicious. An easy sipper great for lunch or with fish, fowl, or pork. A great summer red. A wonderful Pinot Noir. The Nostrano Estate Cabernet Franc 2016 is a light, but impressive red (aged in American oak for 12 months), with a nose that bursts with violet, bright raspberry, strawberry, hints of graphite, and a sizable dose of black pepper at the end. This is a Loire-ish styled Cabernet Franc, bursting with fruit, and flavor. It deserves slow sipping, as there are delicate flavors that will continue to evolve. Nostrano Vineyards may be a new-ish winery (they opened their doors just a few years ago. But they are clear in their desire to be considered among the Hudson Valley's and New York's top quality producers. Their opening statements have been impressive, have flashed some wonderful wines in small quantities, and are poised to make the jump from the small screen to the big screen. They are indeed ready for prime time! Love Nostrano Vineyards! Holy Hell! There's a lot going on in the beer business in the Hudson Valley! Here's a quick recap for those of you who having been keeping score. Singlecut bought Shmaltz Brewery's production facility in Colonie in a bid to keep up production with their beer's popularity. Shmaltz will go back to contract brewing. 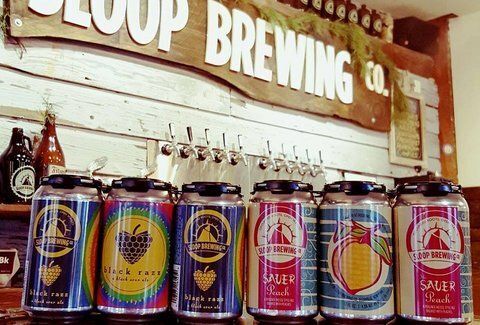 And Sloop Brewing, who moved to Elizaville, NY in Columbia County, not that long ago, it headed for expansion in an old complex formerly owned by IBM in Fishkill, Dutchess County. With the explosion of craft beer n the Hudson Valley, local government, chambers of commerce, and local banks and politicians are all playing their part in wooing companies from one place to another. As the agritourism/craft beverage tourism and production explodes, counties are vying for the hottest brands, helping to find financing, space, and deals to lure the hottest producers. admittedly, I meant to write about this activity months ago. These stories are old already to the local industry. But with more breweries, distilleries, and wineries planning to open in the region, and the aggressive growth of the sector continuing, the Hudson Valley is seemingly a hot ticket. There's probably a lot more to come, especially in the volatile beer industry as well as in the distilling business. Many of the big fish in the liquor business are looking for burgeoning craft distilleries to swallow up or to partner with. Executives from many of the major distributors have been coming the valley looking to make deals for brands and facilities. Wolf Hollow Brewing, located in Glenville, NY, (somewhere west of Schnectady) was profiled in Yankee Brew News, and was featured on the front page! Wolf Hollow has been around sometime now, and has rightfully gained a solid and loyal following. They make great beer. I've been lucky enough to work several events with them. Great folks, great beer, they deserve the recognition! Hudson Valley magazine , in the August 2018 issue, raves about the region's wineries. 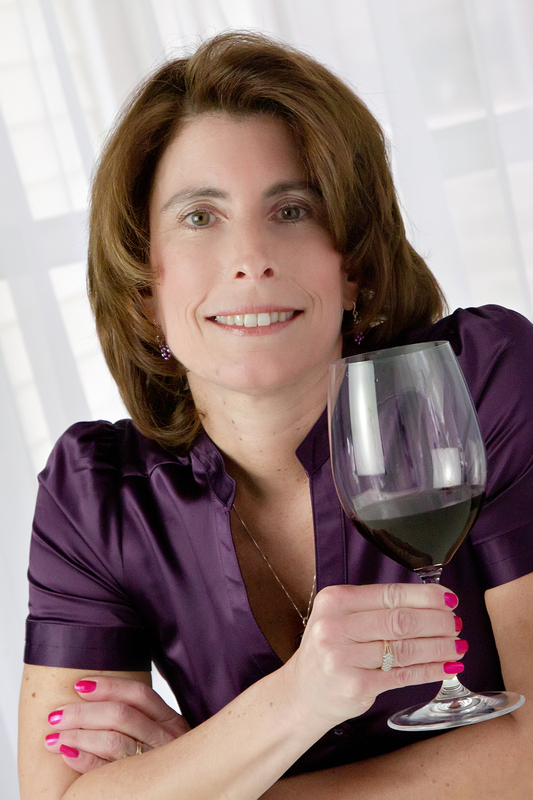 Written by Febbie Gioquindo, also known as the Hudson Valley Wine Goddess, has profiled numerous wineries and trails throughout the southern and mid-Hudson Valley, including producers from the Shawangunk, Dutchess, and Hudson Berkshire wine trails. A great article, highlighting numerous artisanal wines and personalities from the valley! Terrific piece! Go HV! 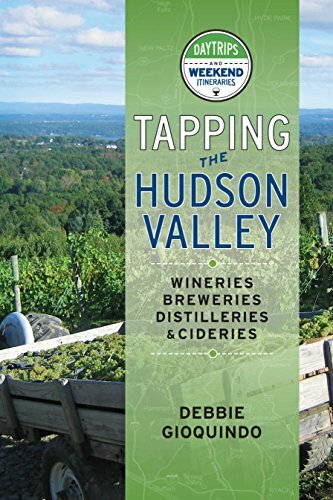 She is also author of Tapping the Hudson Valley! Mike Schnelle and Nancy Irelan owners of Red Tail Ridge Winery make some of my favorite wines on the east coast. I have been to their tasting room at least half a dozen times, if not more, and I always walk away impressed. Just this last July I stopped by the tasting room with friends, Rich Srsich and Bryan Van Deusen and we tasted there again. It's their third or fourth time being there I believe. Red Tail Ridge was an easy unanimous decision on our list of wineries to visit. No conversation needed to happen. Someone mentioned the winery's name, and we all shouted out a unanimous "YES!" James Joyce would have been proud! I didn't think to text or call ahead to see if Nancy were around. We were rushing around trying to hit a few tasting rooms, and I didn't want to hold her up if she was busy. First up was this Red Tail Ridge Gewuztraminer Senca Lake 2017. The nose alone sent me to heaven with tropical notes, and soft flowers, and sweet mango and green apple. The wine was light, delicate, and packed a giant wave of flavor. Bright and zesty, the tropical fruit and green apple gave way to a final pop of grapefruit, lemon and lime. Absolutely lip-smacking. Everything a Gewurztraminer should be. The Red Tail Ridge Dry Rose RTR Estate Vineyard 2017 was one of the prettiest rose wines of the season I have tasted so far. A big nose of fresh strawberry and bright sour cherry gives was to a lovely palate cleansing wine, filled with fresh young fruit and a lovely, zesty finish. Pink fruits slowly melded their way to green apple, lemon zest, and tangerine. A pop of lime. Incredible. This is one of my favorite Pinot Noirs in New York state. The nose of this Red Tail Ridge Pinot Noir Seneca Lake 2015 hits you with blueberries and lavender, as well as bright cherry, mocha, and a hint of earthiness. But what's funny about this wine, when the fruit lingers on at the end, and the wine slowly downshifts, and the resulting flavors are of young strawberries and fresh cherries. An amazing transition. What an elegant, well crafted, immensely layer wine. I loathe Donfelder. I've only had two I liked - one from Santa Barbara, and one from Red Tail Ridge. The Red Tail Ridge Dornfelder RTR Estate Vineyard 2016 is a big, powerful wine, with dark cherry, dark raspberry, cassis, prune, and lekvar. It has enough structure, and enough acidity to keep the big fruits from becoming top heavy. A lovely, lovely wine. This is the kind of wine that tells you something about a grower and a winemaker. This was truly an accomplishment! I jones for Red Tail Ridge's Terolodego. There is no other way to say it. I crave it? I jones for it? I absolutely get night sweats thinking about this wine! The Red Tail Ridge Teroldego RTR Estate Vineyard 2015 is a big wine, with big fruit, dark fruit (think blackberries, cassis, dark plum, dark raspberries) with a spice and earthiness that makes it one of the most muscular red wines of the Finger Lakes. There is a lovely soft transition to vanilla and spice that is magical. All I can think of eating is a charcoal crusty Porterhouse steak for two (Pittsburgh style aka black-and-blue), all for myself! What an absolutely astonishing wine, especially coming from this region! Red Tail Ridge Seneca Lake Blaufrankisch is a non-vintage wine made up from 2015 and 2016 grapes. Bramble and blackberry come raging through this wine, with hints of heather, and farm, earth and spice. A lovely, dark red wine with tremendous flavor that proves to be incredibly mouthwatering. One envisions a big stew or cassoulet while drinking this. Or a mixed grill of game and blood sausages. Not always a big Blaufranisch fan, I think Red Tail Ridge's wine is easily one of the best verietal wines of this grape on the east coast. After the tasting, when we got in the car, all three of us agreed, that Red Tail Ridge was a unanimous winner once again. We never tired of coming here. We had all bought bottles, and we had all been impressed - again! Later, Nancy messaged me on FB, saying she'd been bottling when were were there and could easily have come out to welcome us. But who wants to bother artists while they work? Not me! Joyce would have said "YES!" again. So I went to Big Cork Vineyards in April of 2018 for a grand tasting of Mid-Atlantic/East Coast wines. But I was also especially exited because I am a big fan of Big Cork. Big Cork broke ground in May 2011. On 24 undulating acres in Pleasant Valley, Md., they planted 13 varietals, making BCV the second largest vineyard in Washington County. The tasting room is a large, airy, roomy, modern tasting room with a big helping of fine wine and exceptional small foods and snacks. There is a comittment to wine here....there's no soft selling it. master winemaker and head of operations Dave Collins. Big Cork Vineyards in Rohrersville, Maryland, master winemaker and head of operations is Dave Collins. He's an experienced winemaker, a veteran of many harvests. Dave Collins Vice President of Operations & Master Winemaker has a degree in horticulture from Virginia Tech and more than 30 years of winemaking experience, Collins has been lauded for helping establish Northern Virginia as a premier destination for wine lovers. Previously with Breaux Vineyards, Dave’s wines have garnered hundreds of awards, including Best in Class Merlot and the Virginia Jefferson Cup for Viognier. At Big Cork, Dave oversees the growth and production of 24 acres and 13 varietals. He is at Big Cork to push the boundaries of what can be made on the east coast and is always pushing himself to make better wine. And largely, he succeeds. 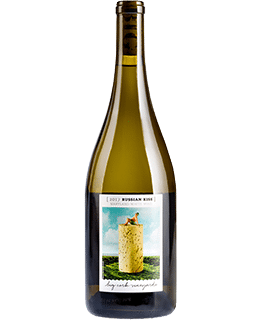 Big Cork Russian Kiss 2017 is a white blend of Russian and Serbian bred varieties, such as SK77-53, SK77-10-69, and XIV 186 and 62% Muscat. The grapes first made their way to the Mid-West back about 30 years ago. According to Collins, Joe Fiola., “The Small Fruit Specialist here in Maryland made me aware of them. I decided to send several thousand off for grafting in California in 2014. We now have 2.5 acres of the Russian varieties planted.” Fiola is with Western Maryland University and one of the best academics/extension folks on the east coast. I first tasted Joe Fiols's Soviet grapes in June of 2013 at a Maryland wine conference co-sponsored by The Cork Report's TasteCamp and Local Wine an organization then spearheaded by Dave McIntyre. But in three subsequent tasting's of Collins' Russian Kiss, I have fallen in love with the wine. Tremendously floral, the nose explodes of of the glass of this exciting white wine. I love this wine, and have bought multiple bottles on each time I have had the wine. Spectacular wine to drink, and a great achievement for Maryland. A great showing of how the university extension experts can help grow the local wine industry. Congrats to Marylanders, Joe and Dave, and to Maryland wine on the whole. A triumph! I am effusive about Big Cork's whites, but they have endeared themselves to many fine wine drinkers by virtue of their incredible reds. Big Cork Vineyards Barbera 2015 is made from 100% estate grown Barbera grapes. Barbera is most famously grown in Piedmonte, Italy. The grapes are hand picked. They are chilled overnight. The wine in matured for approximately 18 months, in a combination of new and older French and American oak barrels for 18 months. The resulting wine is rich in dark and bright cherry, bramble berry, and has hints of wood and spice. An earthy red, it has excellent structure, and a fabulous finish. One of my favorite Big Cork reds. Big Cork Nebbiolo 2015 was just as impressive. 100% estate grown, this grape, made famous by the Italians, cherries, raspberries, tobacco, and earth all come through in this medium-bodied dry red. Lovely fruit keeps on lingering. Lovely, complex with lots of layers. If you are looking for a big, heavy, opaque Chilean/Argentinian Malbec, you'll be disappointed. If you're looking for a lovely, jammy, medium-bodied wine with finesse, elegance, and complexity, you will love Big Cork Malbec 2016. The wine starts of it's attack with blackberry and plum jam, and follows up with violets, earth, and spice. The tannins are soft, as you would expect, and the flavor lingers a nice long time. A delicious soft red, with ample fruit and luscious finish. Yet again, I am amazed by Big Cork and their wines. Wines get better and better each year. And I am always amazed at the multitude of flavors and the quality of the wines. Congrats to all! Not only one of the best wineries in Maryland but one of the better ones on the east coast!